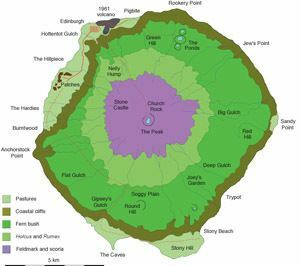 Tristan da Cunha ( ), colloquially Tristan, is the name of both a remote group of volcanic islands in the south Atlantic Ocean and the main island of that group. It is the most remote inhabited archipelago in the world, lying 2,000 kilometres (1,200 mi) from the nearest inhabited land, Saint Helena, and 2,400 kilometres (1,500 mi) from the nearest continental land, South Africa. It is 3,360 kilometres (2,090 mi) from South America. The territory consists of the main island, named Tristan da Cunha, which has a north–south length of 11.27 kilometres (7.00 mi) and an area of 98 square kilometres (38 sq mi), along with the smaller, uninhabited Nightingale Islands and the wildlife reserves of Inaccessible and Gough islands. As of January 2017, the main island has 262 permanent inhabitants. The other islands are uninhabited, except for the personnel of a weather station on Gough Island. Tristan da Cunha is part of the British overseas territory of Saint Helena, Ascension and Tristan da Cunha. This includes Saint Helena and near-equatorial Ascension Island, some 3,730 kilometres (2,318 mi) to the north of Tristan. The islands were first recorded as sighted in 1506 by Portuguese explorer Tristão da Cunha; rough seas prevented a landing. He named the main island after himself, Ilha de Tristão da Cunha. It was later anglicised from its earliest mention on British Admiralty charts, to Tristan da Cunha Island. Some sources state that the Portuguese made the first landing in 1520, when the Lás Rafael captained by Ruy Vaz Pereira called at Tristan for water. The first undisputed landing was made on 7 February 1643 by the crew of the Dutch East India Company ship Heemstede, captained by Claes Gerritsz Bierenbroodspot. The Dutch stopped at the island four more times in the next 25 years, and in 1656 created the first rough charts of the archipelago. The first full survey of the archipelago was made by crew of the French corvette Heure du Berger in 1767. The first scientific exploration was conducted by French naturalist Louis-Marie Aubert du Petit-Thouars, who stayed on the island for three days in January 1793, during a French mercantile expedition from Brest, France to Mauritius. Aubert made botanical collections and reported traces of human habitation, including fireplaces and overgrown gardens, probably left by Dutch explorers in the 17th century. The first permanent settler was Jonathan Lambert, from Salem, Massachusetts, United States, who arrived at the islands in December 1810 with two other men, and later a third. Lambert publicly declared the islands his property and named them the Islands of Refreshment. Three of the four men died in 1812; however, the survivor among the original three permanent settlers, Thomas Currie (or Tommaso Corri) remained as a farmer on the island. In 1816, the United Kingdom annexed the islands, ruling them from the Cape Colony in South Africa. This is reported to have primarily been a measure to ensure that the French would be unable to use the islands as a base for a rescue operation to free Napoleon Bonaparte from his prison on Saint Helena. The occupation also prevented the United States from using Tristan da Cunha as a cruiser base, as it had during the War of 1812. The islands were occupied by a garrison of British Marines and a civilian population gradually grew. Whalers set up bases on the islands for operations in the Southern Atlantic. However, the opening of the Suez Canal in 1869, together with the gradual transition from sailing ships to coal-fired steam ships, increased the isolation of the islands. They were no longer needed as a stopping port for lengthy sail voyages, or for shelter for journeys from Europe to East Asia. In 1867, Prince Alfred, Duke of Edinburgh and second son of Queen Victoria, visited the islands. The main settlement, Edinburgh of the Seven Seas, was named in honour of his visit. On 15 October 1873, the Royal Navy scientific survey vessel HMS Challenger docked at Tristan to conduct geographic and zoological surveys on Tristan, Inaccessible Island and the Nightingale Islands. In his log, Captain George Nares recorded a total of 15 families and 86 individuals living on the island. After an especially difficult winter in 1906, and years of hardship since the 1880s, the British government offered to evacuate the island. Those remaining on Tristan held a meeting and decided to refuse, thus deepening the island's isolation. It was reported that no ships visited from 1909 until 1919, when HMS Yarmouth finally stopped to inform the islanders of the outcome of World War I. The Shackleton–Rowett Expedition stopped in Tristan for 5 days in May 1922, collecting geological and botanical samples before returning to Cape Town. Of the few ships that visited in the coming years were the RMS Asturias, a Royal Mail Steam Packet Company passenger liner, in 1927, and the ocean liners RMS Empress of France in 1928, RMS Duchess of Atholl in 1929, and RMS Empress of Australia in 1935. In 1936, The Daily Telegraph of London reported the population of the island was 167 individuals, with 185 cattle and 42 horses. From December 1937 to March 1938, a Norwegian party made a dedicated Scientific Expedition to Tristan da Cunha, and sociologist Peter A. Munch extensively documented island culture (he would later revisit the island in 1964-1965). The island was also visited in 1938 by W. Robert Foran, reporting for the National Geographic Society, whose account Tristan da Cunha, Isles of Contentment was published in November 1938. On 12 January 1938 by Letters Patent, Britain declared the islands a dependency of Saint Helena, creating the British Overseas Territory of Saint Helena and Dependencies, which also included Ascension Island. During the Second World War, Britain used the islands as a secret Royal Navy weather and radio station codenamed HMS Atlantic Isle, to monitor Nazi U-boats (which were required to maintain radio contact) and shipping movements in the South Atlantic Ocean. The Duke of Edinburgh, the Queen's consort, visited the islands in 1957 as part of a world tour on board the royal yacht HMY Britannia. On 10 October 1961, the eruption of Queen Mary's Peak forced the evacuation of the entire population of 264 individuals. Evacuees took to the water in open boats and sailed to uninhabited Nightingale Island, where they were picked up by a Dutch passenger ship that took them via Cape Town to Britain. The islanders arrived in the UK to a big press reception, and were settled in an old Royal Air Force camp outside of Calshot, Hampshire. The following year a Royal Society expedition went to the islands to assess the damage, and reported that the settlement of Edinburgh of the Seven Seas had been only marginally affected. Most families returned in 1963. On 23 May 2001, the islands were hit by an extratropical cyclone that generated winds up to 190 kilometres per hour (120 mph). A number of structures were severely damaged, and numerous cattle were killed, prompting emergency aid provided by the British government. In 2005, the islands were given a United Kingdom post code (TDCU 1ZZ), to make it easier for the residents to order goods online. On 13 February 2008, fire destroyed the fishing factory and the four generators that supplied power to the island. On 14 March 2008, new generators were installed and uninterrupted power was restored. This fire was devastating to the island because fishing is a mainstay of the economy. While a new factory was being planned and built, M/V Kelso came to the island and acted as a factory ship, with island fishermen based on board for stints normally of one week. The new facility was ready in July 2009, for the start of the 2009–10 fishing season. The St Helena, Ascension and Tristan da Cunha Constitution Order 2009 ended the "dependency status" of Ascension and Tristan da Cunha. On 16 March 2011, the freighter MS Oliva ran aground on Nightingale Island, spilling tons of heavy fuel oil into the ocean. The resulting oil slick threatened the island's population of rockhopper penguins. Nightingale Island has no fresh water, so the penguins were transported to Tristan da Cunha for cleaning. A total solar eclipse will pass over the island on 5 December 2048. The island is calculated to be on the centre line of the umbra's path for nearly three and a half minutes of totality. Inaccessible Island and the Nightingale Islands are 35 kilometres (22 mi) SW by W and SSW off the main island respectively, whereas Gough Island is 395 kilometres (245 mi) SSE. The main island is generally mountainous. The only flat area is on the north-west coast, which is the location of the only settlement, Edinburgh of the Seven Seas. The highest point is a volcano called Queen Mary's Peak 2,062 metres (6,765 ft), which is covered by snow in winter. The other islands of the group are uninhabited, except for a weather station with a staff of six on Gough Island. This has been operated by South Africa since 1956 (since 1963 at its present location at Transvaal Bay on the south-east coast). The archipelago has a wet oceanic climate under the Köppen system with mild temperatures, but consistent moderate to heavy rainfall and very limited sunshine, due to the persistent westerly winds. Under the Trewartha classification Tristan da Cunha is a humid subtropical climate due to the lack of cold temperatures. The number of rainy days is comparable to the Aleutian Islands at a much higher latitude in the northern hemisphere, while sunshine hours are comparable to Juneau, Alaska, 20° farther from the equator. Frost is unknown below elevations of 500 metres (1,600 ft) and summer temperatures are similarly mild, never reaching 25 °C (77 °F). Sandy Point on the east coast is reputed to be the warmest and driest place on the island, being in the lee of the prevailing winds. Many of the flora and fauna have a broad circumpolar distribution in the South Atlantic and South Pacific Oceans. Thus many of the species that occur in Tristan da Cunha appear as far away as New Zealand. For example, the plant species Nertera depressa was first collected in Tristan da Cunha, but has since been recorded in occurrence as far distant as New Zealand. Tristan is primarily known for its wildlife. The island has been identified as an Important Bird Area by BirdLife International because there are 13 known species of breeding seabirds on the island and two species of resident land birds. The seabirds include northern rockhopper penguins, Atlantic yellow-nosed albatrosses, sooty albatrosses, Atlantic petrels, great-winged petrels, soft-plumaged petrels, broad-billed prions, grey petrels, great shearwaters, sooty shearwaters, Tristan skuas, Antarctic terns and brown noddies. Tristan and Gough Islands are the only known breeding sites in the world for the Atlantic petrel (Pterodroma incerta; IUCN status EN). Inaccessible Island is also the only known breeding ground of the Spectacled Petrel (Procellaria conspicillata; IUCN Vulnerable). The Tristan albatross (IUCN status CR) is known to breed only on Gough and Inaccessible Islands: all nest on Gough except for one or two pairs who nest on Inaccessible Island. The endemic Tristan thrush or starchy occurs on all of the northern islands and each has its own subspecies, with Tristan birds being slightly smaller and duller than those on Nightingale and Inaccessible. The endemic Inaccessible Island rail, the smallest extant flightless bird in the world, is found only on Inaccessible Island. In 1956 eight Gough moorhens were released at Sandy Point on Tristan, and have subsequently colonised the island. Various species of whales and dolphins can be seen around Tristan from time to time with increasing sighting rate although recovery of baleen whales especially the southern right whale were severely hindered by illegal whaling by the Soviet Union. The subantarctic fur seal Arctocephalus tropicalis can also be found in the Tristan archipelago, mostly on Gough Island. The island's unique social and economic organisation has evolved over the years, but is based on the principles set out by William Glass in 1817, when he established a settlement based on equality. All Tristan families are farmers, owning their own stock and/or fishing. All land is communally owned. All households have plots of land at The Patches on which they grow potatoes. Livestock numbers are strictly controlled to conserve pasture and to prevent better-off families from accumulating wealth. Unless the community votes for a change in its law, no outsiders are allowed to buy land or settle on Tristan; theoretically the whole island would have to be put up for sale. All people – including children and pensioners – are involved in farming, while adults additionally have salaried jobs working either for the Government, or, a small number in domestic service. Many of the men are involved in the fishing industry, going to sea in good weather. The nominal fishing season lasts 90 days; however, during the 2013 fishing season – 1 July to 30 September – there were only 10 days suitable for fishing. Valuable foreign earnings come from the royalties from the commercial crawfish or Tristan rock lobster (Jasus) industry. Other revenues are derived from the sale of postage stamps and coins, especially to collectors worldwide. Limited revenue from tourism includes providing accommodation, guides and sales of handicrafts and souvenirs to visitors and by mail order. The income from foreign revenue earners enables Tristan to run Government services, especially health and education. The 1961 volcanic eruption destroyed the Tristan da Cunha canned crawfish factory, which was rebuilt a short time later. The crawfish catchers and processors work for the South African company Ovenstone, which has an exclusive contract to sell crawfish to the United States and Japan. Although Tristan da Cunha is a UK overseas territory, it is not permitted direct access to European Union markets. Recent economic conditions have meant that the islanders have had to draw from their reserves. The islands' financial problems may cause delays in updating communication equipment and improving education on the island. The fire of 13 February 2008 (see History) resulted in major temporary economic disruption. Although Tristan da Cunha is part of the same overseas territory as Saint Helena, it does not use the local Saint Helena pound. Instead, the island uses the United Kingdom issue of the pound sterling. The Bank of Saint Helena was established on Saint Helena and Ascension Island in 2004. This bank does not have a physical presence on Tristan da Cunha, but residents of Tristan are entitled to its services. There are occasionally commemorative coins minted for the island. The island is located in the South Atlantic Anomaly, an area of the Earth with an abnormally weak magnetic field. On 14 November 2008 a geomagnetic observatory was inaugurated on the island as part of a joint venture between the Danish Meteorological Institute and DTU Space. The remote location of the islands makes transport to the outside world difficult. Lacking an airport, the islands can be reached only by sea. Fishing boats from South Africa service the islands eight or nine times a year. The RMS Saint Helena used to connect the main island to St Helena and South Africa once each year during its January voyage, but has done so only twice in the last few years, in 2006 and 2011. The wider territory normally has access to air travel, with Ascension island served by RAF Ascension Island., though flights for civilians were indefinitely suspended in April 2017. The Saint Helena Airport was constructed and expected to open in May 2016 but has been delayed due to shear wind. There is no direct, regular service to Tristan da Cunha itself from either location. The harbour at Edinburgh of the Seven Seas is called Calshot Harbour, named after the place in Hampshire where the islanders temporarily stayed during the volcanic eruption. Although Tristan da Cunha shares the +290 code with St Helena, residents have access to the Foreign and Commonwealth Office Telecommunications Network, provided by Global Crossing. This uses a London 020 numbering range, meaning that numbers are accessed via the UK telephone numbering plan. 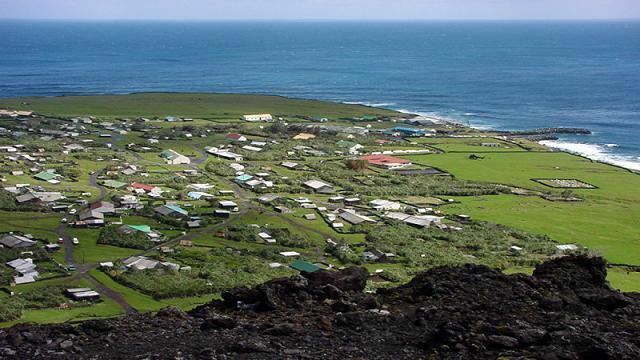 From 1998 to 2006, internet was available in Tristan da Cunha but its high cost made it almost unaffordable for the local population, who primarily used it only to send email. The connection was also extremely unreliable, connecting through a 64 kbit/s satellite phone connection provided by Inmarsat. From 2006, a very-small-aperture terminal provided 3072 kbit/s of publicly accessible bandwidth via an internet cafe. There is no mobile phone coverage on the islands. DXpeditions are sometimes conducted in the island group by amateur radio operators. One was ZD9ZS in September/October 2014. Executive authority is vested in the Queen, who is represented in the territory by the Governor of Saint Helena. As the Governor resides permanently in Saint Helena, an Administrator is appointed to represent the Governor in the islands. The Administrator is a career civil servant in the Foreign Office and is selected by London. Since 1998, each Administrator has served a three-year term (which begins in September, upon arrival of the supply ship from Cape Town.) The Administrator acts as the local head of government, and takes advice from the Tristan da Cunha Island Council. Sean Burns began a second term as Administrator in November 2016. The Island Council is made up of eight elected and three appointed members, who serve a three-year term which begins in February (or March). Chief Islander: From amongst the eight elected councillors, the one receiving the most votes is named "Chief Islander" and sometimes serves as Acting Administrator when the Administrator is off the island: Ian Lavarello was elected for a third consecutive three-year term in 2016. As Chief Islander, he lit the island's beacon celebrating the Queen's Diamond Jubilee in 2012. The Administrator and Island Council work from the Government Building, which is the only two-storey building on the island. The building is sometimes referred to as "Whitehall" or the "H'admin Building" and contains the Administrator's Office, Treasury Department, Administration Offices, and the Council Chamber where Island Council meetings are held. Tristan da Cunha has some legislation of its own, but the law of Saint Helena applies generally (to the extent that it is not inconsistent with local law, insofar as it is suitable for local circumstances and subject to such modifications as local circumstances make necessary). Tristan da Cunha recorded a population of 293 in the March 2016 census. The only settlement is Edinburgh of the Seven Seas (known locally as "The Settlement"). The only religion is Christianity, with denominations of Anglican and Roman Catholic. The current population is thought to have descended from 15 ancestors, eight males and seven females, who arrived on the island at various times between 1816 and 1908. The males were European and the women were mixed race and African. Now all of the population has mixed ancestry. In addition, a male contributor of eastern European/Russian descent arrived in the early 1900s. In 1963 when families returned after the evacuation (due to the 1961 volcanic eruption), the 200 settlers included four Tristan da Cunha women who brought with them new English husbands. The women descendants have been traced by genetic study to five female founders, believed to be women of colour (mixed-race, of African, Asian and European descent) from Saint Helena. The historical data recounted that there were two pairs of sisters, but the MtDNA evidence showed only one pair of sisters. The early male founders originated from Scotland, England, the Netherlands, the United States and Italy, and belonged to 3 Y-haplogroups: I (M170), R-SRY10831.2 and R (M207) (xSRY10831.2) and share nine surnames: Collins, Glass, Green, Hagan, Lavarello, Repetto, Rogers, Squibb and Swain. In addition, a new haplotype was found that is associated with men of eastern Europe and Russia. It entered the population in the early 1900s, at a time when the island was visited by Russian sailing ships. There is "evidence for the contribution of a hidden ancestor who left his genes but not his name on the island." Another four instances of non-paternity were found among male descendants, but researchers believed their fathers were probably among the island population. There are 80 families on the island. Tristan da Cunha's isolation has led to development of an unusual, patois-like dialect of English described by the writer Simon Winchester as "a sonorous amalgam of Home Counties lockjaw and 19th century idiom, Afrikaans slang and Italian." Bill Bryson documents some examples of the island's dialect in his book, The Mother Tongue. Education is fairly rudimentary; children leave school at age 16, and although they can take GCSEs a year later, few do. The school on the island is St Mary's School, which serves children from ages 4 to 16. It opened in 1975 and has five classrooms, a kitchen, a stage, a computer room, and a craft and science room. The Tristan Song Project was a collaboration between St Mary's School and amateur composers in Britain, led by music teacher Tony Triggs. It began in 2010 and involved St Mary's pupils writing poems and Tony Triggs providing musical settings by himself and his pupils. A desktop publication entitled Rockhopper Penguins and Other Songs (2010) embraced most of the songs completed that year and funded a consignment of guitars to the school. In February 2013 the Tristan Post Office issued a set of four Song Project stamps featuring island musical instruments and lyrics from Song Project songs about Tristan's volcano and wildlife. In 2014 the Project broadened its scope and continues as the International Song Project. There are instances of health problems attributed to endogamy, including glaucoma. In addition, there is a very high (42%) incidence of asthma among the population and research by Dr. Noe Zamel of the University of Toronto has led to discoveries about the genetic nature of the disease. Three of the original settlers of the island were asthma sufferers. In 2012 Dr Gerard Bulger was the only qualified doctor on the island, providing medical services for the 270 inhabitants. A small hospital - the Camogli Hospital - which has ultrasound, X-ray facilities a gastroscope, but no sigmoidoscope. There were no nurses, only care assistants, but Bulger praised the care provided in the community. Bulger reported difficulty keeping pharmacy and consumable stocks in date. Supplies came from South Africa. One of his jobs was to check the water supply. Healthcare is funded by the government, undertaken by one resident doctor from South Africa and five nurses. Surgery or facilities for complex childbirth are therefore limited, and emergencies can necessitate communicating with passing fishing vessels so the injured person can be ferried to Cape Town. As of late 2007, IBM and Beacon Equity Partners, co-operating with Medweb, the University of Pittsburgh Medical Center and the island's government on "Project Tristan", has supplied the island's doctor with access to long distance tele-medical help, making it possible to send EKG and X-ray pictures to doctors in other countries for instant consultation. This system has been limited owing to the poor reliability of Internet connections and an absence of qualified technicians on the island to service fibre optic links between the hospital and Internet centre at the administration buildings. Local television began in 1984 using taped programming on Tuesday, Thursday and Sunday evenings. Live television did not arrive on the island until 2001, with the introduction of the British Forces Broadcasting Service, which now provides BBC1, BBC2, ITV and BFBS Extra, relayed to islanders via local analogue transmitters. BFBS Radio 2 is the locally available radio station. A comprehensive website www.tristandc.com is provided by the island government and the Tristan da Cunha Association which maintains it from the UK. A weekly local printed newsletter, Village Voice, is produced on the island. According to the island's January 2014 newsletter, the summer season gets under way with Sheep Shearing Day held on a Saturday in mid-December. Almost the entire population gathers on the far end of Patches Plain where the sheep pens are sited. Hand-clippers are used in the shearing and the wool is later carded, spun and hand-knitted into garments, some of which are sold under the name "37 Degrees South Knitwear Range". There is an annual break from government and factory work which begins before Christmas and lasts for 3 weeks. Break-Up Day is usually marked with parties at various work "departments". Break-Up includes the Island Store, which means that families must be organised to have a full larder of provisions during the period. In 2013, the Island Store closed a week earlier than usual to conduct a comprehensive inventory, and all purchases had to be made by Friday 13 December as the shop did not open again until a month later. The January 2014 New Year Message from Administrator Alex Mitham announced that, in 2013, the Island Council recognised there was no national holiday that specifically celebrates Tristan's heritage and culture, 'So I am pleased to announce that the Council have agreed that a new national holiday called Longboat Day that will be instated in 2015, and the traditional longboats race brought back.' There was no immediate indication of which date would be selected for the new holiday. In Wim Wenders' Wings of Desire, a dying man recollecting the things that have apparently meant most to him mentions "Tristan da Cunha". 37°4 S is a short film about two teenagers who live on the island. Edgar Allan Poe's The Narrative of Arthur Gordon Pym of Nantucket (1838), Chapter 15, has a detailed history and description of the island. In Jules Verne's novel In Search of the Castaways, one of the chapters is set on Tristan da Cunha, and a brief history of the island is mentioned. The island is also referred to in Verne's novel The Sphinx of the Ice Fields (1897), which he wrote as an unauthorised sequel to Poe's The Narrative of Arthur Gordon Pym of Nantucket. The 1899 English translation by Mrs. Cashel Hoey of Ice Fields was published under the title An Antarctic Mystery. South African poet Roy Campbell wrote "Tristan de Cunha" (1927) Tristan de Cunha, an elegiac poem about the island. Tristan da Cunha is the site of a top-secret nuclear disarmament conference in Fletcher Knebel's 1968 political thriller Vanished. The book was adapted as a 1971 two-part NBC made-for-TV movie starring Richard Widmark. Hervé Bazin's novel Les Bienheureux de la Désolation (1970) describes the 1961 forced exile of the population to England after the volcano erupted, and their subsequent return. In Primo Levi's memoir The Periodic Table (1975), one of the fictional short stories, "Mercurio", is set on Tristan da Cunha, named "Desolation Island". In Patrick O'Brian's novel The Mauritius Command (1977), Tristan da Cunha is mentioned by a man fond of birds, Captain Fortescue of the schooner Wasp, who spent an extended period on the island studying the Albatross whilst cast ashore. Also in O'Brian's The Thirteen-Gun Salute (1991), the ship Dianne is nearly wrecked on Inaccessible Island, with the cover of the book depicting the scene. Zinnie Harris's play, Further Than the Furthest Thing (2000), is inspired by events on the island, notably the 1961 volcanic eruption and evacuation of the islanders. Raoul Schrott's novel, Tristan da Cunha oder die Hälfte der Erde (2003), is almost entirely set on Tristan da Cunha and Gough islands, and chronicles the history of the archipelago. Alice Munro's short story Deep-Holes in her 2009 short story collection Too Much Happiness. The female protagonist, a mother, confides to her young son about her fascination with remote islands like Tristan da Cunha and the Faeroe Islands. Later, when her son goes missing, she fantasises that he has found his way to one of these islands and is living there. In the book Pulse by Jeremy Robinson, Tristan de Cunha is the top secret headquarters of "Beta Incorporated", a shell company of the antagonistic "Manifold Genetics", which is later destroyed by artificially causing an eruption to self-destruct said base, killing most of the Edinburgh of the Seven Seas population. Frank T. Bullen provides details of visiting the island in the 1870s in his book The Cruise of the Cachalot, first published in 1898. Raymond Rallier du Baty describes the people and the island circa 1908 in his book 15,000 Miles in a Ketch (1915). In Shackleton's Last Voyage by Captain Frank Wild (1923), several chapters (with photographs) recount events on the island during the Shackleton–Rowett Expedition in May 1922. Rose Annie Rogers, part of an American missionary couple, wrote a memoir of her time on Tristan da Cunha, called The Lonely Island (1927). Katherine Mary Barrow's book Three Years in Tristan Da Cunha (1910) is a "simple and true description of daily life among a very small community cut off from the rest of the world" based on entries to her diaries and letters written during the period to her sister. Martin Holdgate describes a visit to the island by a scientific expedition heading for Gough Island in 1955 in Mountains in the Sea. Simon Winchester's Outposts: Journeys to the Surviving Relics of the British Empire (1985, reprinted in 2003), devotes a chapter to the island, which he visited in the mid-1980s. In the foreword to the reprint, the author states that he was banned from Tristan da Cunha because of his writing about the war-time romance of a local woman. He published a longer account of his banishment in Latham's Quarterly. In 2005, Rockhopper Copper, the first book about the island written by an Islander, was published. It was written by Conrad Glass, Tristan da Cunha's longtime Police and Conservation officer. Robert A. Heinlein's book Tramp Royale (1992), about a world trip in 1953–54, devoted a chapter to his near visit to Tristan da Cunha. He talked to islanders but could not go ashore owing to the weather.